Gold Holographic Metal flake available in 3 Sizes, Micro .004″, Mini .008″ , and Bass Boat .015″ 400 degree temperature threshold. Available in 4 oz. Jars or 1 lb. Bags. Our Gold Holographic Metal Flake additives are very versatile and can be used in so many applications. Creating a great Gold Holographic metal flake paint job is super simple with our flakes. Just choose your base coat (black is good if you want the paint to take on the color of the flakes), and add a heaping tablespoon of our flake to any base clear coat (although we recommend a base clear for mixing the flake into, like PPG’s DBC-500, or HOK’s inter coat clear). 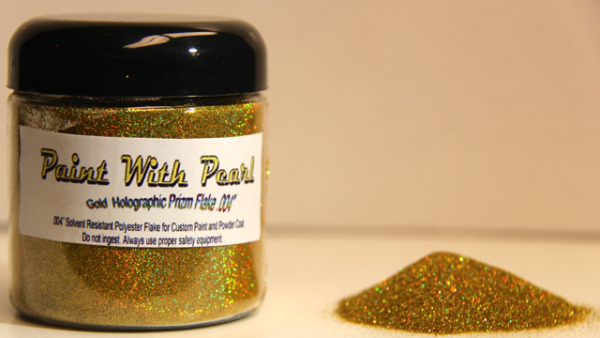 Gold Holographic Metal Flake comes in many sizes, including .004″, .008″, .015″. It has a 400 degree temp. threshold. Is for paint, powder coat, anything. This 25 gram Bronze Copper Kolor Pearls metallic powder is a great pigment for creating your very own tinted clears in paint or powder-coating applications. It is guaranteed to mix well with any clear paints or tinted kandy paints, and has a temperature threshold of about 400 degrees fahrenheit. It is a very fine powder and will spray well through airbrushes, powder guns, and HVLP paint guns. It is very light, so it stays well mixed in paint without settling too fast in your gun, and can make great tinted clears for light to heavy effects (it's your choice). One 25 gram bag of Bronze Copper Kolor Pearls ® treats from 1 to 4 quarts of clear. This 25 gram Bag of Violet kandy Pearls ® pigment powder is a great pigment for creating your very own tinted clears in paint or powder-coating applications. It is guaranteed to mix well with any clear paints or tinted kandy paints, and has a temperature threshold of about 400 degrees fahrenheit. It is a very fine powder and will spray well through airbrushes, powder guns, and HVLP paint guns. It is very light, so it stays well mixed in paint without settling too fast in your gun, and can make great tinted clears for light to heavy effects (it's your choice). One 25 gram bag of Violet Kolor Pearls ® treats from 1 to 4 quarts of clear. We sell to hundreds of different types of coaters, including dippers, nail polish manufacturers, Theme Park painters, and kustom shoe designers, to name just a few. This 25 gram Yellow Metallic Paint Kolor Pearls powder is a great pigment for creating your very own tinted clears in paint or powder-coating applications. It is guaranteed to mix well with any clear paints or tinted kandy paints, and has a temperature threshold of about 400 degrees fahrenheit. It is a very fine powder and will spray well through airbrushes, powder guns, and HVLP paint guns. It is very light, so it stays well mixed in paint without settling too fast in your gun, and can make great tinted clears for light to heavy effects (it's your choice). One 25 gram bag of Yellow Metallic Paint Kolor Pearls treats from 1 to 4 quarts of clear.